On the eastern edge of Lafayette, a circle of roads connects the historic town of St. Martinville with picturesque Lake Fausse Pointe. This was our weekend destination, and we launched the adventure from the Crawfish Capitol of the World – Breaux Bridge. As we passed under the bridge and over Bayou Teche, the kids jolted from their naps and began fidgeting with anticipation. The sleepy downtown was filled with antique stores and the promise of amazing treasures, but one glance at the wild-eyed kiddos in back, and we continued south through the countryside to the equally charming town of St. Martinville. As Charles catapulted from the car, he was stopped in his tracks by our friend who had followed along on the trip. Shaking off his momentary confusion, he pulled her along in his quest for new discoveries in Louisiana’s third oldest town. The ample grounds of St. Martin de Tours Catholic Church was the perfect location for running off some energy and adding to our rapidly growing collection of twigs. 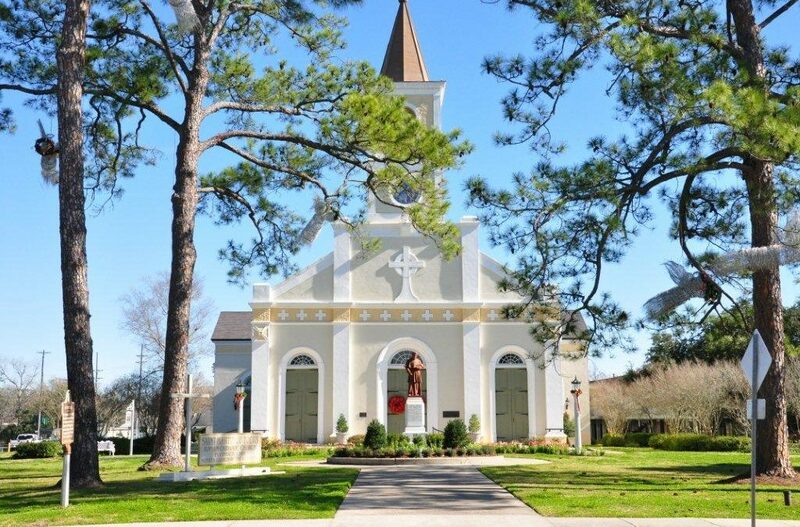 A man removing Christmas decorations drew us to the church’s front doors, and we ducked under his ladder to enter “the Mother Church of the Acadians” – descendants of the French colonists forced out of Nova Scotia during the French and Indian War. The strong smell of incense lingered in the air inside, encircling us as we toured the gated pews and colorful patterns reflecting on the floor from the stained-glass windows. Before we could go any farther, we crossed the street for burgers and fries at Le Petit Paris Cafe. We were the only patrons in the quaint restaurant, which gave the kids free reign to squeal and play to their delight. The rest of the historic buildings are centered around the church, and we strolled past the Duchamp Opera House and La Maison Duchamp on our way to Bayou Teche and the Evangeline Oak. Immortalized by Longfellow’s poem “Evangeline,” the ancient oak is one of the most photographed spots in the state. From St. Martinville, we headed out Catahoula Highway past an intriguing oak and pine alley to the levee road that leads to Lake Fausse Pointe State Park. It was here that, after reuniting with some good friends and tearing both their children and ours away from the playground, we set off to discover nature. At one time part of the Atchafalaya Basin, the 6,000-acre park features both boardwalk and canoe trails through the watery home of alligators and bald cypress trees. Although the sounds of our nine-person group tromping through the forest scared away any signs of life, we couldn’t help but enjoy the fresh air and lovely scenery. On the way out, we traveled the levee road back to I-10, where in the tiny town of Henderson, we enjoyed a seafood-filled dinner at Pat’s Fisherman Wharf. It was dark when we drove away with full bellies and memories of another Louisiana adventure.